An 18-month-old baby, Ali Saad Dawabsha, has been killed and three of his family members seriously injured in a suspected "price tag" arson attack by Jewish settlers in the northern West Bank. According to eyewitnesses, at least two masked men arrived at the Palestinian village of Douma at around 4am on Friday morning. 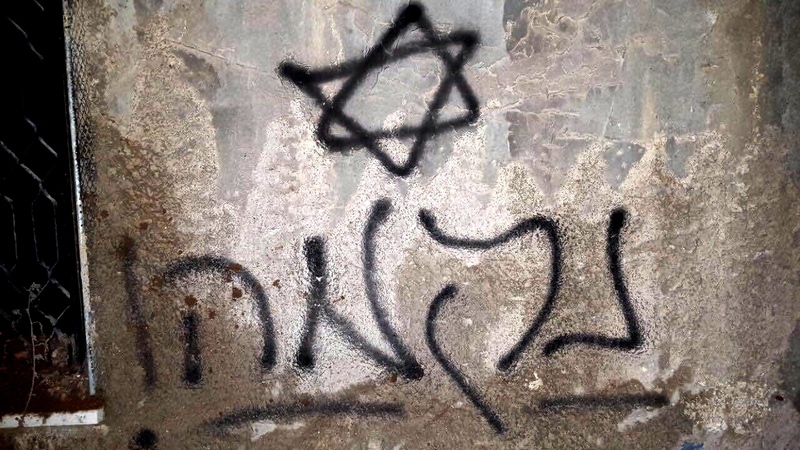 The assailants smashed the windows of two houses, threw firebombs inside, and scrawled Hebrew graffiti on the wall reading "Revenge" and "Long live the Messiah." Locals claimed they saw the men flee in the direction of Ma'aleh Ephraim, a settlement nearby to the village. The Israeli army has called the attack on Douma, close to the town of Nablus, an act of "Jewish terror." "This was an intentional attack against civilians in their homes and nothing less than a barbaric act of terrorism," Peter Lerner, spokesperson for the Israel Defense Forces (IDF) said in a statement. One of the two attacked houses, which were set ablaze immediately by the firebombs, was empty at the time but inside the other the Dawabsha family were sleeping. According to eyewitnesses, Sa'ad Dawabsha was able to rescue his wife and four-year-old son but could not reach the infant in time. All three survivors have been hospitalized in moderate to severe conditions. "Price tag" is the name given to attacks by Jewish extremists in revenge for actions against settlers taken by the Israeli government — literally exacting a "heavy price" in retaliation for perceived wrongs against their community. Palestinian villages are frequently the targets of settler violence, but left-wing activists and Christian holy sites have also been attacked. Earlier this week Jewish settlers threw rocks at Israeli security forces and set tires on fire at Beit El, a settlement in the southern West Bank, after the army moved in to demolish two unfinished apartments that Israel's High Court had ruled were built without proper planning permission. In response to the unrest Israeli Prime Minister Benjamin Netanyahu pledged to build 300 new homes in the settlement, deemed illegal under international law, and also gave the green light to the construction of a further 500 Jewish housing units in occupied East Jerusalem. The IDF told VICE News that it was "too early" to link Friday's attack on Douma to anger over Beit El but said that a combined task force of the Shin Bet security agency, Israeli police, and army were doing "everything possible" to find the perpetrators and prevent an escalation of violence in the area. "We are taking necessary steps to deal with potential deterioration on the ground including increased military presence in the field and heightened security," added Lerner. According to the UN Office for the Coordination of Humanitarian Affairs, in 2014 more than 300 acts of settler attacks on Palestinians resulted in injury or property damage; an average of six per week. Zakaria Sedda, a field research coordinator for Rabbis for Human Rights, who visited Douma in the early hours of Friday morning said that attacks on the village by settlers were frequent. "There have been many attacks here. They burn down houses, they pull up trees," he told VICE News. "They army and police don't dare do their jobs and investigate the terrorist attacks." Investigations by Yesh Din, an Israeli human rights NGO, have found that between 2005 and 2014 only 7.4 percent of more than 1,000 cases it helped Palestinians file with the Israeli police force resulted in an indictment. According to the organization more than 80 percent of cases were closed due to insufficient investigations by the police force. The Palestinian Liberation Organization (PLO) said that it holds the Israeli government "fully responsible" for the "assassination of the toddler." "This is a direct consequence of decades of impunity given by the Israeli government to settler terrorism," said PLO Secretary General Saeb Erekat. On Thursday evening, in a separate incident, an ultra-Orthodox Jewish extremist Yishai Schlissel attacked a gay pride parade stabbing six participants, leaving two in a critical condition. Schlissel was previously jailed for 12 years for knifing three men during the parade in 2005 but was released early. Prior to Thursday's event he had talked to an ultra-Orthodox radio about how was "worthwhile to do something extreme" against the LGBT community. "These impure people want to defile Jerusalem," he said. "The objective — I need to stop this parade."